MacKerricher State Park encloses a seven mile stretch of the north California coast, in Mendocino County between Fort Bragg and the Ten Mile River, and contains varied scenery of sand dunes, beaches, cliffs, tidepools, wetlands, pine/fir forest and a freshwater lagoon. Some parts are quite developed, as the park has a visitor center, four (rather expensive) campgrounds and several boardwalk trails, yet admission is free and away from the entrance road most areas are quite empty, so it is easy to find solitude. MacKerricher is reached by CA 1, along the northernmost section of the highway 20 miles from the point where it veers inland to avoid the Lost Coast, and all the park lies between the road and the ocean - a mile-wide strip of land that is mostly wooded or grassy to the south, giving way to sand dunes in the north. 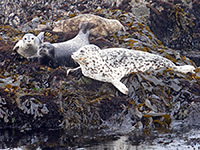 The place is quite popular for a wide range of activities, principally camping, fishing (lake and ocean), swimming, diving, sunbathing, photography, hiking, horse riding and cycling - routes for these last two include a section of old railroad track, once used to transport timber from the coastal hills to Fort Bragg. The park is named after the MacKerrichers, a local ranching and lumber family, who donated the land to the state in 1950. The park road forks off CA 1 three miles north of Fort Bragg and 165 miles from San Francisco. A complete, 30-foot long whale skeleton provides an unusual attraction, beside the entrance station, after which the road passes the campgrounds and leads to the main day use area, first reaching the lagoon (Lake Cleone), a small but scenic pond, lined by reeds and wind-sculpted fir trees, and resting place for many species of birds. The course of the old railway (now known as the haul road) runs past close by, forming part of the California Trail, and extending northwards all the way along the sand dunes to the Ten Mile River. The road ends at the parking area for Laguna Point, a promontory that divides the sandy shoreline to the north from the rockier coast to the south. 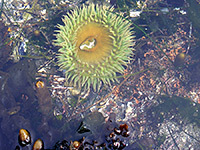 The point is surrounded at low tide by large areas of tidepools and exposed kelp- and sea palm-covered terraces, all harboring extensive sea life including crabs, sea stars, mussels, urchins, anemones, sea lions and harbor seals. Migrating gray whales swim by during winter and spring, heading for Baja California. Paths lead a couple of miles further south to Fort Bragg, along an undeveloped part of the coast, past many sea stacks and small coves beneath cliffs that are fairly sheer but only 10 to 20 feet high so it is easy to climb down. 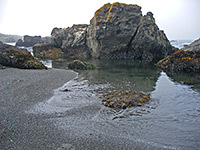 There are also two larger beaches, around the ends of Virgin Creek and Pudding Creek, while right at the south edge of the park, Glass Beach is the former location of a refuse dump from Fort Bragg, and although since cleaned, the sands remain mixed with many fragments of water-polished glass. 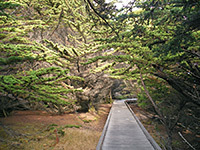 Laguna Point also has a short boardwalk trail through a grove of shore pines, accompanied by notices about the history of the area. This part of the coast was once the preserve of the Pomo and Yuki Indians, and descendants of these tribes still visit the sea shore to collect plants for use in traditional ceremonies. The nearest town with hotels is Fort Bragg, bordering the park to the south.